If you ever forget your password, you may use the form at the bottom of the "Password" entry page and we will immediately/automatically email it to you. (This works only if you still can receive emails at the email address you entered when you registered or last updated your profile on this site.) If you have failed to update to your new email address and no longer have access to your old email address, then you will need to email gospel@NewTestamentChurch.org and we will manually update the new email address for you. If you registered under an old email address, try that address and then update to your new email address once you have access to the members' area. #2. Subject: "Cookies" & Placing NewTestamentChurch.org in your “Trusted Sites” Zone. It appears that a new Microsoft update has increased the security of browsers... but has caused some members not to be able to enter the “members area” of our website. If you are having this problem, you will need to place http://www.NewTestamentChurch.org and http://www.NT-C.org in the “Trusted Sites" Zone on your browser. Most likely the new updates have dis-abled "cookies" on your browser that are needed for the members area. Temporary "cookies" are stored on your computer to verify that you are a valid user. If your system is not set up to accept cookies, you will be unable to view the members’ portion of the site. Some Web sites store information in a small text file, called a "cookie," on your hard disk. Cookies contain information about you and your preferences. For example, if you inquire about a flight schedule at an airline's Web site, the site might create a cookie that contains your itinerary. Or it might only contain a record of which pages within the site you visited, to help the site customize the view for you the next time you visit. Only the information that you provide, or the choices you make while visiting a Web site, can be stored in a cookie. For example, the site cannot determine your e-mail name unless you choose to type it. Allowing a Web site to create a cookie does not give that or any other site access to the rest of your computer, and only the site that created the cookie can read it. Internet Explorer is set up to allow the creation of cookies; however, you can specify that you be prompted before a site puts a cookie on your hard disk, so you can choose to allow or disallow the cookie; or you can prevent Internet Explorer from accepting any cookies. You can specify different settings for different security zones. For example, you might want to allow Web sites to create cookies if they are in your Trusted sites or Local intranet zone, prompt you before creating cookies if they are in your Internet zone, and never allow cookies if they are in your Restricted sites zone. 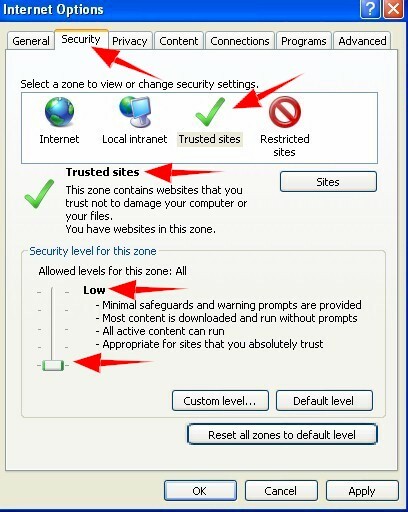 Click the Security tab and then click the “Trusted Site” zone icon... then place setting to “low”. Remove check mark in check box next to: "Require server verification (https:)"
Now add: http://www.newtestamentchurch.org and click “Add”. Now add: http://www.NT-C.org and click “Add”. Now add: http:*.newtestamentchurch.org (period “.” after the “*”) and click “Add”. If your browser is not MS Explorer, then you will need to go to the "Help" menu of your browser and do a search for information on "cookies." This should fix the members’ entry problem, HOWEVER... If it does not fix it on your machine, please let me know so I can research other possibilities.